DeMarquis D. Wyatt, Assistant to the Director of Space Flight Development, testified in support of a National Aeronautics and Space Administration (NASA) request for $3 million from Congress for research into space rendezvous techniques. He explained what these funds would be used for. The logistic support of a manned space laboratory, a possible post-Mercury development, would depend on the resolution of certain key problems to make rendezvous practical, among them the establishment of referencing methods for fixing the relative positions of two vehicles in space; the development of accurate, lightweight target aquisition equipment to enable the supply craft to locate the space station; the development of very accurate guidance and control systems to permit precise determination of flight paths; and the development of sources of controlled power. House Committee on Science and Astronautics and Subcommittees Nos. 1, 2, 3, and 4, Hearings on H.R. 6512, 1960 NASA Authorization , 86th Cong., 1st Sess., 1959, pp. 97, 170, 267-268. The Goett committee met for the first time. On April 1, John W. Crowley, NASA's Director of Aeronautical and Space Research, had appointed Harry J. Goett of NASA Ames Research Center, Moffett Field, California, to chair a Research Steering Committee on Manned Space Flight. Committee members agreed from the outset to concern themselves with the long-range objectives of NASA's man-in-space program, which meant deciding on the kinds of supporting research required, coordinating the research activities of the various NASA centers, and making recommendations on research and vehicles. The first order of business before the committee was a manned space flight program to follow Mercury. H. Kurt Strass of NASA's Space Task Group (STG), Langley Field, Virginia, described some preliminary STG ideas on Mercury follow-ups. These included: (1) an enlarged Mercury capsule to put two men in orbit for three days; (2) a two-man Mercury plus a large cylinder to support a support a two-week mission; and (3) the Mercury plus a cylinder attached by cables to a launch vehicle upper stage, the combination to be rotated to provide artificial gravity. In its 1960 budget, NASA had requested $2 million to study possible methods of constructing a manned orbiting laboratory or converting the Mercury capsule into a two-man laboratory for extended space flights. Memo, NASA to Langley and Lewis Research Centers, Subj: Research Steering Committee on Manned Space Flight, Apr.1, 1959; Minutes of Meetings of Research Steering Committee on Manned Space Flight, May 25-26, 1959, pp. 1, 2, 6, 7, 9; House Subcommittee of the Committee on Appropriations, Hearings, National Aeronautics and Space Administration Appropriations, 86th Cong., 1st Sess, 1959, pp. 42-45. At a staff meeting, Space Task Group Director Robert R. Gilruth suggested studying a Mercury follow-on program using maneuverable Mercury capsules for land landings in predetermined areas. Memo, Paul E. Purser to Gilruth, Subj: Log for the Week of June 1, 1959. Memo, Strass to Chief, FSD, Subj: Activation of a Study Group Pertaining to Advanced Manned Space Projects, June 22, 1959. The New Projects Panel of Space Task Group (STG) met for the first time, with H. Kurt Strass in the chair. The panel was to consider problems related to atmospheric reentry at speeds approaching escape velocity, maneuvers in the atmosphere and space, and parachute recovery for earth landing. Alan B. Kehlet of STG's Flight Systems Division was assigned to initiate a program leading to a second-generation capsule incorporating several advances over the Mercury spacecraft: It would carry three men; it would be able to maneuver in space and in the atmosphere; the primary reentry system would be designed for water landing, but land landing would be a secondary goal. At the next meeting, on August 18, Kehlet offered some suggestions for the new spacecraft. The ensuing discussion led panel members to agree that a specifications list should be prepared as the first step in developing an engineering design requirement. Memos, Strass to Chief, FSD, Subj: First Meeting of New Projects Panel..., Aug 15, 1959; Second Meeting of the New Projects Panel..., Aug 26, 1959. McDonnell Engineering Report No. 6919, "Follow On Experiments, Project Mercury Capsules, 1 September 1959," revised Oct. 5, 1959. Figure 1. 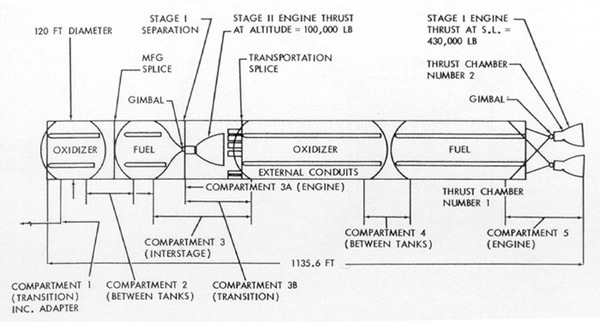 McDonnell's proposed mission for a Mercury capsule modified to be capable of maneuvering in orbit. This was one of the six follow-on series of experiments incorporated in the company's report on potential uses of the Mercury capsule beyond the officially approved program. Space Task Group's (STG) New Projects Panel discussed the McDonnell Aircraft Corporation proposals for follow-on experiments using Project Mercury capsules. After concluding that these proposals came under panel jurisdiction, Chairman H. Kurt Strass asked for further studies to provide STG with suggestions for action. Discussion at the panel's next meeting on October 5 centered on McDonnell's proposals. All had shortcomings, but the panel felt that certain potentially valuable elements might be combined into a single proposal promising increased spacecraft performance and an opportunity to evaluate some advanced mission concepts at an early date. Noting that any amplification of current Mercury missions would demand increased orbital weight, the panel advised an immediate study of possible follow-on missions to determine the performance specifications for a second-stage propulsion system with restart and thrust control capability. Other studies were needed to specify a second-stage guidance and control system to ensure the achievement of the desired orbital altitude (up to 150 miles) and to control reentry within the heat protection limits of the current, or slightly modified, capsule. Also worth studying, in the panel's opinion, were maneuvering in orbit (rendezvous experiments) and within the atmosphere (reentry control experiments). Memos, Strass to Chief, FSD, Subj: Third Meeting of New Project Panel...(Information), Oct. 1, 1959; Fourth Meeting of the New Projects Panel...(action requested), Oct. 7, 1959. Memo, Dennis F. Hasson to Chief, FSD, Subj: Meeting of January 7, 1960, to Discuss Future Wind-Tunnel Test Needs for Advanced Mercury Projects, Jan. 11, 1960. Preliminary specifications were issued by Space Task Group (STG) to modify the Mercury capsule by adding a reentry control navigation system. The modified capsule would obtain a small lifting capability (lift-over-drag ratio would equal approximately 0.26). The self-contained capsule navigation system would consist of a stable platform, a digital computer, a possible star tracker, and the necessary associated electronic equipment. Dispersion from the predicted impact point would be less than 10 miles. The prospective development called for a prototype to be delivered to NASA for testing in February 1961; and first qualified system, or Modification I, to be delivered by August 1961; and the final qualified system, or Modification II, to be delivered by January 1962. STG anticipated that four navigational systems (not including prototype or qualification units) would be required. NASA-STG, Subj: Preliminary Specification for Reentry Control Navigation System, Apr. 5, 1960. Representatives of NASA's research centers gathered at Langley Research Center to present papers on current programs related to space rendezvous and to discuss possible future work on rendezvous. During the first day of the conference, papers were read on the work in progress at Langley, Ames, Lewis, and Flight Research Centers, Marshall Space Flight Center, and Jet Propulsion Laboratory. The second day was given to a roundtable discussion. All felt strongly that rendezvous would soon be essential, that the technique should be developed immediately, and that NASA should make rendezvous experiments to develop the technique and establish the feasibility of rendezvous. John M. Eggleston, "Inter-NASA Research and Space Development Centers Discussion on Space Rendezvous, Langley Research Center, May 16-17, 1960," May 25, 1960. Space Task Group (STG) issued a set of guidelines for advanced manned space flight programs. The document comprised five papers presented by STG personnel at a series of meetings with personnel from NASA Headquarters and various NASA field installations during April and May. Primary focus was a manned circumlunar mission, or lunar reconnaissance, but in his summary, Charles J. Donlan, Associate Director (Development), described an intermediate program that might fit into the period between the phasing out of Mercury and the beginning of flight tests of the multimanned vehicle. During this time, "it is attractive to consider the possibility of a flight-test program involving the reentry unit of the multimanned vehicle which at times we have thought of as a lifting Mercury." What form such a vehicle might take was uncertain, but it would clearly be a major undertaking; much more information was needed before a decision could be made. To investigate some of the problems of a reentry vehicle with a lift-over-drag ratio other than zero, STG had proposed wind tunnel studies of static and dynamic stability, pressure, and heat transfer at Langley, Arnold Engineering Development Center, and Ames facilities. STG, "Guidelines for Advanced Manned Space Vehicle Program," June 1960, pp. ii, 49-50, 52, 53. Figure 2. One version of the "lifting" Mercury capsule being considered in 1960 for a flight test program between the end of Mercury and the start of a manned circumlunar program. McDonnell Aircraft Corporation proposed a one-man space station comprising a Mercury capsule plus a cylindrical space laboratory capable of supporting one astronaut in a shirtsleeve environment for 14 days in orbit. Gross weight of the combined vehicle at launch would be 7259 pounds (Mercury, as of October 25, 1960, was 4011 pounds), which would provide an 1100-pound, laboratory-test payload in a 150-nautical-mile orbit, boosted by an Atlas-Agena B. The result would be a "minimum cost manned space station." McDonnell, "One Man Space Station," Aug. 24, 1960 (rev. Oct. 28, 1960). NASA's Space Exploration Program Council met in Washington to discuss manned lunar landing. Among the results of the meeting was an agreement that NASA should plan an earth-orbital rendezvous program independent of, although contributing to, the manned lunar program. Minutes, Space Exploration Program Council Meeting, Jan. 5-6, 1961. Space Task Group management held a Capsule Review Board meeting. The first topic on the agenda was a follow-on Mercury program. Several types of missions were considered, including long-duration, rendezvous, artificial gravity, and flight tests of advanced equipment. Major conclusion was that a follow-on program needed to be specified in greater detail. STG, "Notes on Capsule Review Board Meeting," with enclosed chart, "Follow-on Mercury Missions," Jan. 20, 1961. NASA and McDonnell began discussions of an advanced Mercury spacecraft. McDonnell had been studying the concept of a maneuverable Mercury spacecraft since 1959. On February 1, Space Task Group (STG) Director Robert R. Gilruth assigned James A. Chamberlin, Chief, STG Engineering Division, who had been working with McDonnell on Mercury for more than a year, to institute studies with McDonnell on improving Mercury for future manned space flight programs. Work on several versions of the spacecraft, ranging from minor modifications to radical redesign, got under way immediately. Early in March, the prospect of conducting extravehicular operations prompted Maxime A. Faget of STG to query John F. Yardley of McDonnell about the possibility of a two-man version of the improved Mercury. Yardley raised the question with Walter F. Burke, a McDonnell vice president, who in turn ordered that a design drawing of a two-man Mercury be prepared. STG described the work in progress at McDonnell to Abe Silverstein of NASA Headquarters in a meeting at Wallops Island, Virginia, March 17-20. On April 1, James T. Rose of STG joined Chamberlin in studying possible objectives for the advanced Mercury; he concentrated on mission planning, trajectory analysis, and performance. Memo, Purser to Gilruth, Subj: Log for the Week of Jan. 30, 1961, Feb. 6, 1961; paper, McDonnell, anon., "Early History of Project Gemini," undated; Action Items, Management Discussion, Mar. 17-20, 1961; interviews: Purser, Houston, Mar. 17, 1964; Chamberlin, Houston, Feb. 15, 1965, and Mar. 10, 1966; Rose, St. Louis, Apr. 13, 1966; Burke, St. Louis, Apr. 15, 1966; Yardley, St. Louis, Apr. 13, 1966; conversation with Faget, Houston, March 1966. "Early History of Project Gemini"; interviews: Fred J. Sanders, St. Louis, Apr. 14, 1966; Winston D. Nold, St. louis, Apr. 14, 1966; Glenn F. Bailey, Houston, Dec. 13, 1966. Major General Don R. Ostrander, NASA Director of Launch Vehicle Programs, described plans for work on orbital rendezvous techniques to the House Committee on Science and Astronautics. The subject of orbital rendezvous figured prominently in House hearings on NASA's proposed 1962 budget. On May 23, the Committee met to hear Harold Brown, Director of Defence Research and Engineering, and Milton W. Rosen, Ostrander's Deputy, explain the needs for orbital rendezvous, the means of achieving if, and the support level of component activities required to achieve it. House Committee on Science and Astronautics and Subcommittees Nos. 1, 3, and 4, Hearings on H.R. 3238 and H.R. 6029 (superseded by H.R. 6874), 1962 NASA Authorization [No. 7], Part 2, 87th Cong., 1st Sess, 1961, pp. 805-806; House Committee on Science and Astronautics, Hearing, Orbital Rendezvous in Space [No. 13], 87th Cong., 1st Sess., May 23, 1961. Anticipating the expanded scope of manned space flight programs, Space Task Group (STG) proposed a manned spacecraft development center. The nucleus for a center existed in STG, which was handling the Mercury program. A program of much larger magnitude would require a substantial expansion of staff and facilities and of organization and management controls. STG, "Manned Spacecraft Development Center, Organizational Concepts and Staffing Requirements," May 1, 1961. A NASA Headquarters working group, headed by Bernard Maggin, completed a staff paper presenting arguments for establishing an integrated research, development, and applied orbital operations program at an approximate cost of $1 billion through 1970. The group identified three broad categories of orbital operations: inspection, ferry, and orbital launch. It concluded that future space programs would require an orbital operations capability and that the development of an integrated program, coordinated with Department of Defense, should begin immediately. The group recommended that such a program, because of its scope and cost, be independent of other space programs and that a project office be established to initiate and implement the program. NASA Hqs., staff paper, "Guidelines for a Program for Manned and Unmanned Orbital Operations," May 1961; briefing memo, Maggin to Assoc. Adm., Subj: Staff Paper-"Guidelines for a Program for Manned and Unmanned Orbital Operations," May 22, 1961. Interview, Seamans, Washington, May 26, 1966. Space Task Group (STG) issued a Statement of Work for a Design Study of a Manned Spacecraft Paraglide Landing System. The purpose of the study was to define and evaluate problem areas and to establish the design parameters of a system to provide spacecraft maneuverability and controlled energy descent and landing by aerodynamic lift. McDonnell was already at work on a modified Mercury spacecraft; the proposed paraglide study was to be carried on concurrently to allow the paraglide landing system to be incorporated as an integral subsystem. STG Director Robert R. Gilruth requested that contracts for the design study be negotiated with three companies which already had experience with the paraglide concept: Goodyear Aircraft Corporation, Akron, Ohio; North American Aviation, Inc., Space and Information Systems Division, Downey, California; and Ryan Aeronautical Company, San Diego, California. Each contract would be funded to a maximum of $100,000 for a study to be completed within two and one-half months from the date the contract was awarded. Gilruth expected one of these companies subsequently to be selected to develop and manufacture a paraglide system based on the approved design concept. In less than three weeks, contracts had been awarded to all three companies. Before the end of June, the design study formally became Phase I of the Paraglider Development Program. Memos, Gilruth to STG Procurement Officer, Subj: Design Study of a Paraglide Landing System for a Manned Spacecraft, with enc., May 17 and 22, 1961; "Statement of Work for a Design Study of a Manned Spacecraft Paraglide Landing System," May 17, 1961; "Paraglider Development Program, Phase I-Design Study: Test Programs," June 30, 1961. James A. Chamberlin, Chief, Engineering Division, Space Task Group (STG), briefed Director Robert R. Gilruth, senior STG staff members, and George M. Low and John H. Disher of NASA Headquarters on McDonnell's advanced capsule design. The design was based on increased component and systems accessibility, reduced manufacturing and checkout time, easier pilot insertion and emergency egress procedures, greater reliability, and adaptability to a paraglide landing system. It departed significantly from Mercury capsule design in placing most components outside the pressure vessel and increasing retrograde and posigrade rocket performance. The group was reluctant to adopt what seemed to be a complete redesign of the Mercury spacecraft, but it decided to meet again on June 12 to review the most desirable features of the new design. 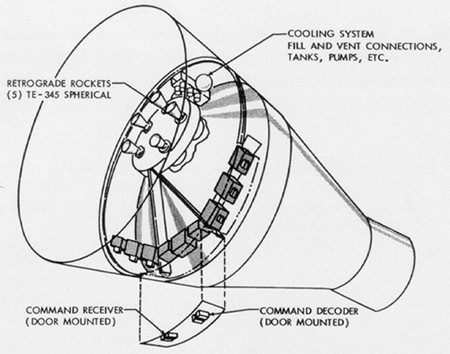 After discussing most of these items at the second meeting, the group decided to ask McDonnell to study a minimum-modification capsule to provide an 18-orbit capability. STG, "Notes on Capsule Review Board Meeting, McDonnell Advanced Capsule Design," June 9, 12, 1961. Space Task Group and McDonnell representatives discussed paraglider engineering and operations problems at a meeting in St. Louis. Immediate concerns were how to prevent the spacecraft from "nosing in" during the landing phase, a requirement for increased stowage areas in the spacecraft, and a method to effect emergency escape for the pilot after deployment of the paraglider wing. Minutes of Meeting, Subj: Paraglider Development Program, June 21, 1961. Walter F. Burke of McDonnell summarized the company's studies of the redesigned Mercury spacecraft for Space Task Group's senior staff. 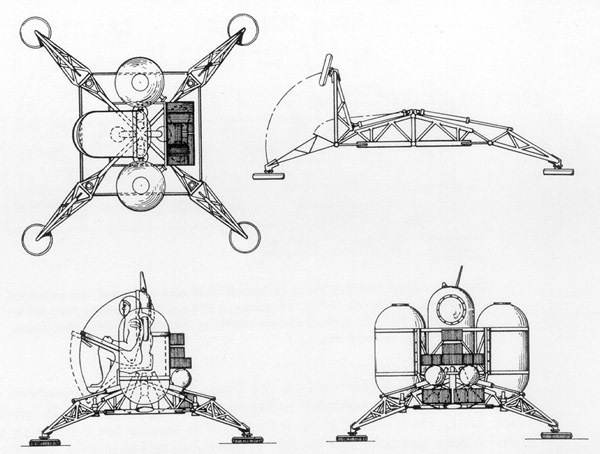 McDonnell had considered three configurations: (1) the minimum-change capsule, modified only to improve accessibility and handling, with an adapter added to carry such items as extra batteries; (2) a reconfigured capsule with an ejection seat installed and most of the equipment exterior to the pressure vessel on highly accessible pallets; and (3) a two-man capsule, similar to the reconfigured capsule except for the modification required for two rather than one-man operation. The capsule would be brought down on two Mercury-type main parachutes, the ejection seat serving as a redundant system. 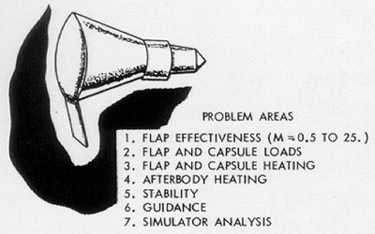 In evaluating the trajectory of the two-man capsule, McDonnell used Atlas Centaur booster performance data. STG, "Notes on Senior Staff Meeting, Presentation by McDonnell Aircraft Corporation on the Results of Mercury Capsule Hardware Studies Applicable to an Advanced Mercury Program," July 11, 1961. "Early History of Project Gemini"; McDonnell Report, "Manned Spacecraft-Advanced Versions," July 27-28, 1961. Space Task Group engineers James A. Chamberlin and James T. Rose proposed adapting the improved Mercury spacecraft to a 35,000-pound payload, including a 5,000-pound "lunar lander." This payload would be launched by a Saturn C-3 in the lunar-orbit-rendezvous mode. The proposal was in direct competition with the Apollo proposals that favored direct landing on the Moon with a 150,000-pound payload launched by a Nova-class vehicle of approximately 12 million pounds of thrust. Interviews: Rose; Chamberlin, Houston, June 9, 1966. Decker, Martin-Baltimore, "A Program Plan for a Titan Boosted Mercury Vehicle," July 1961. Representatives of Martin Company briefed Director Robert R. Gilruth and some of the senior staff of Space Task Group on Titan II technical characteristics and expected performance. At a senior staff meeting four days later, August 7, Gilruth commented on the Titan II's promise for manned spaceflight, particularly its potential ability to place larger payloads in orbit than could Atlas, which would make it "a desirable booster for a two-man spacecraft." Martin had estimated the cost of procuring and launching nine Titan II boosters, with cost of ancillary equipment, at $47.889 million spread over fiscal years 1962 through 1964. STG, "Notes on Senior Staff Meeting," Aug. 8, 1961, p. 3; Purser, notes on briefing by Decker and Bastian Hello of Martin to Gilruth et al. 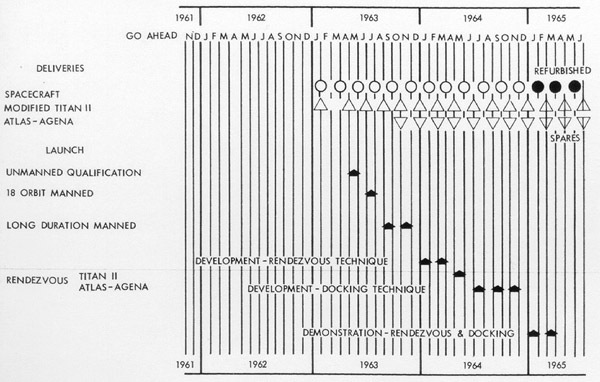 on Titan II technical and performance aspects, Aug. 3, 1961; Chart, Mercury-Titan Program, Program Cost, Aug. 2, 1961. Figure 9. The modified Titan II booster that was to launch the advanced Mercury spacecraft. Fred J. Sanders and three other McDonnell engineers arrived at Langley Research Center to help James A. Chamberlin and other Space Task Group (STG) engineers who had prepared a report on the improved Mercury concept, now known as Mercury Mark II. Then, with the assistance of Warren J. North of NASA Headquarters Office of Space Flight Programs, the STG group prepared a preliminary Project Development Plan to be submitted to NASA Headquarters. Although revised six times before the final version was submitted on October 27, the basic concepts of the first plan remained unchanged in formulating the program. Interviews: Sanders; Chamberlin, June 9, 1966; William C. Muhly, Houston, June 2, 1967; STG, "Preliminary Project Development Plan for an Advanced Manned Space Program Utilizing the Mark II Two Man Spacecraft," Aug. 14, 1961. James A. Chamberlin, Chief of Space Task Group (STG) Engineering Division, expecting approval of the Mark II spacecraft program within 30 days, urged STG Director Robert R. Gilruth to begin reorienting McDonnell, the proposed manufacturer, to the new program. To react quickly once the program was approved, McDonnell had to have an organization set up, personnel assigned, and adequate staffing ensured. Chamberlin suggested an amendment to the existing letter contract under which McDonnell had been authorized to procure items for Mercury Mark II. This amendment would direct McDonnell to devote efforts during the next 30 days to organizing and preparing to implement its Mark II role. Memo, Chamberlin to Director, Subj: Proposed Amendment to Letter Contract No. 6 to Contract NAS 5-59, with enc., Oct. 27, 1961. Space Task Group (STG), assisted by George M. Low, NASA Assistant Director for Space Flight Operations, and Warren J. North of Low's office, prepared a project summary presenting a program of manned spaceflight for 1963-1965. This was the final version of the Project Development Plan, work on which had been initiated August 14. A two-man version of the Mercury spacecraft would be lifted by a modified Titan II booster. 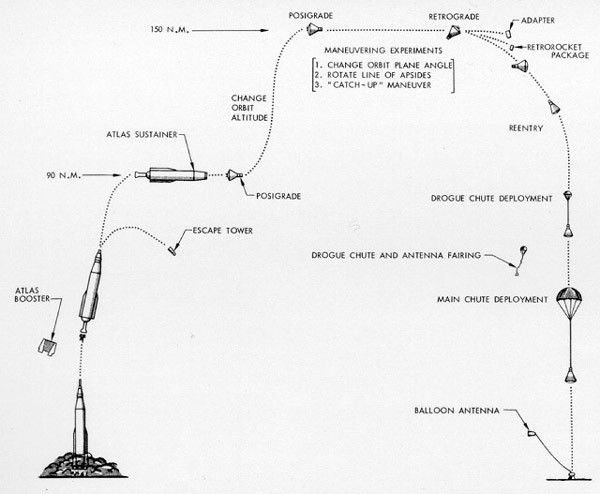 The Atlas-Agena B combination would be used to place the Agena B into orbit as the target vehicle for rendezvous. The proposed plan was based on extensive use of Mercury technology and components for the spacecraft. A suggestion was incorporated to negotiate a sole-source, cost-plus-fixed-fee contract with McDonnel Aircraft Corporation for the Mark II Mercury spacecraft. Launch vehicle procurement would be arranged through the Air Force: with General Dynamics/Astronautics, San Diego, California, for Atlas launch vehicles; with Martin-Marietta Space Systems Division (Martin-Baltimore), Baltimore, Maryland, for the modified Titan II launch vehicles; and with Lockheed Missiles and Space Company, Sunnyvale, California, for the Agena target vehicles. A project office would be established to plan, direct, and supervise the program. Manpower requirements for this office were expected to reach 177 by the end of fiscal year 1962. Estimated cost of the proposed program was about $530 million. STG justified this plan by suggesting that the next step in manned space exploration after Mercury would be to gain experience in long-duration and rendezvous missions. The Mark II program was to provide an immediate continuation of a successful Project Mercury, using equipment and vehicles already developed for other programs as much as possible. The Mark II would allow a much wider range of mission objectives than Mercury, which could not readily be adapted to other than simple orbital missions of up to one day's duration. 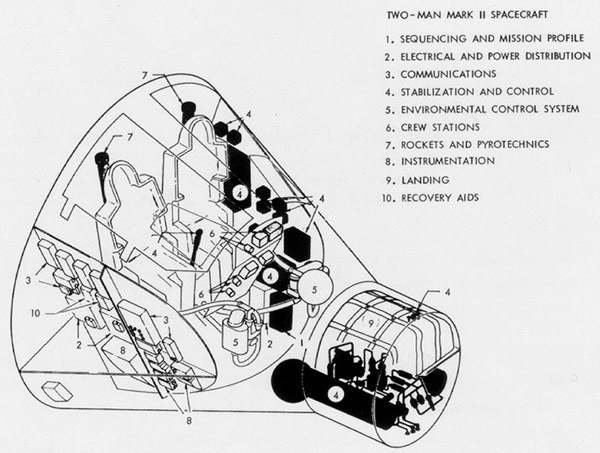 Mark II objectives encompassed flights of longer duration than the 18 orbits to which Mercury was limited, making a multiman crew necessary, contributing to the development of operational techniques and equipment for extended space flights, and providing data on the psychological and physiological effects on the crew of lengthy periods in the space environment. Objectives also included flights to develop techniques for achieving rendezvous in orbit--a necessary prelude to advanced flights in order to extend the limits on mission capabilities imposed by the limitations of available boosters--and controlled land landing to avoid or minimize the magnitude of the effort required to recover spacecraft at sea and to put spaceflight on something like a routine basis. The Mark II project would be quickly accomplished; not only would most hardware be modifications of what already existed, but equipment would be modularized, allowing mission requirements and available hardware to be maintained in balance with minimum dislocations. Twelve flights were planned, beginning with an unmanned qualification flight in May 1963. Succeeding flights would occur at two-month intervals, ending in March 1965. Flight No. 2 would be a manned 18-orbit mission with the twin objectives of testing crew performance in missions of that length and of further qualifying the spacecraft for longer missions. The next two flights (Nos. 3 and 4) would be long-duration tests to demonstrate the crews' ability to function in space for up to 14 days. Remaining flights were to establish orbital rendezvous techniques and to demonstrate the capability to rendezvous and dock in space. STG, "Project Development Plan for Rendezvous Development Utilizing the Mark II Two-Man Spacecraft," Oct. 27, 1961; interview, James E. Bost, Houston, June 1, 1967. Interviews: Walter D. Smith and Hello, Baltimore, May 23, 1966. Space Task Group's Engineering Division Chief James A. Chamberlin and Director Robert R. Gilruth briefed NASA Associate Administrator Robert C. Seamans, Jr., at NASA Headquarters on the Mercury Mark II proposal. Specific approval was not granted, but Chamberlin and Gilruth left Washington convinced that program approval would be forthcoming. Space Task Group, the organization charged with directing Project Mercury and other manned space flight programs, was redesignated Manned Spacecraft center, with Robert R. Gilruth as Director. Memo, Purser to MSC Employees, Subj: Designation of Space Task Group as "Manned Spacecraft Center," Nov. 1, 1961. 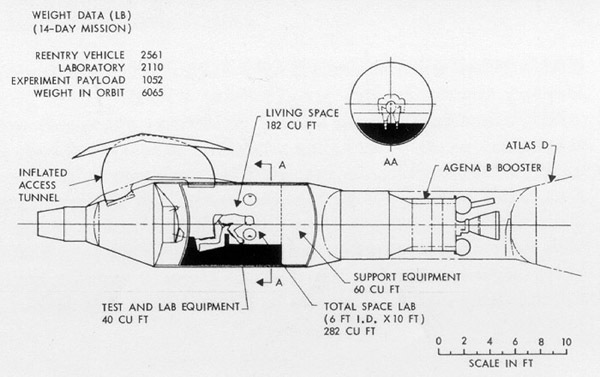 McDonnell submitted to Manned Spacecraft Center the detail specification of the Mercury Mark II spacecraft. A number of features closely resembled those of the Mercury spacecraft. Among these were the aerodynamic shape, tractor rocket escape tower, heatshield, impact bag to attenuate landing shock, and the spacecraft-launch vehicle adapter. Salient differences from the Mercury concept included housing many of the mission-sustaining components in an adapter that would be carried into orbit rather than being jettisoned following launch, bipropellant thrusters to effect orbital maneuvers, crew ejection seats for emergency use, onboard navigation system (inertial platform, computers, radar, etc. ), and fuel cells as electrical power source in addition to silver-zinc batteries. The long-duration mission was viewed as being seven days. McDonnell Report No. 8356, "Mercury Mk II Spacecraft Detail Specification," Nov. 15, 1961. Manned Spacecraft Center notified North American to proceed with Phase II-A of the Paraglider Development Program. A letter contract, NAS 9-167, followed on November 21; contract negotiations were completed February 9, 1962; and the final contract was awarded on April 16, 1962. 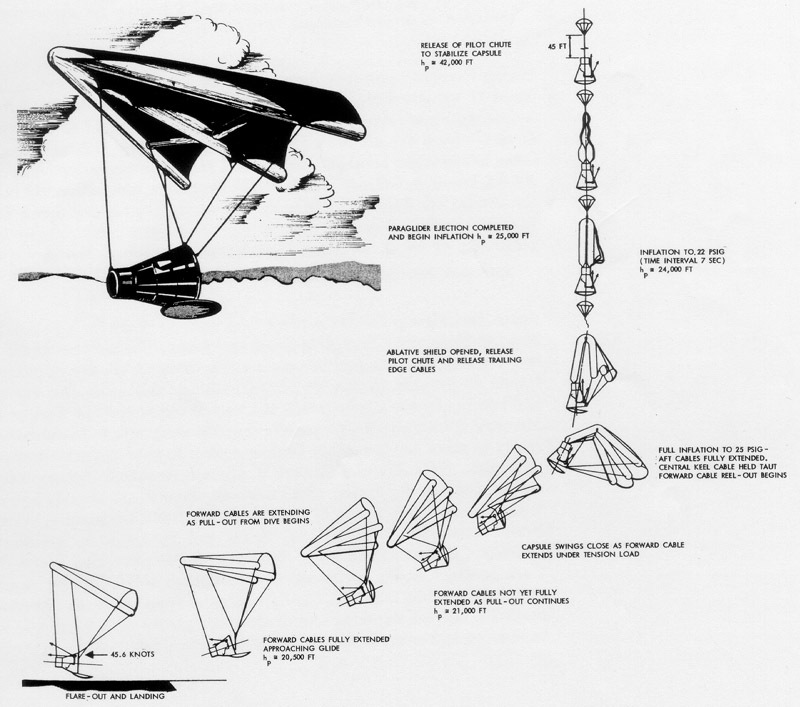 Phase I, the design studies that ran from the beginning of June to mid-August 1961, had already demonstrated the feasibility of the paraglider concept. Phase II-A, System Research and Development, called for an eight-month effort to develop the design concept of a paraglider landing system and to determine its optimal performance configuration. This development would lay the groundwork for Phase II, Part B, comprising prototype fabrication, unmanned and manned flight testing, and the completion of the final system design. Ultimately Phase III-Implementation-would see the paraglider being manufactured and pilots trained to fly it. Message, Bailey to Neil C. Dopheide, Nov. 20, 1961; STG, "Statement of Work for Phase II, Part A, System Research and Development of a Paraglider Development Program," Sept. 15, 1961; NAA, letter 63MA8041, Subj: Final Settlement Proposal, Paraglider, Phase II, Part A, NAS 9-167, June 11, 1963, p. I-1. Milton W. Rosen, Director of Launch Vehicles and Propulsion in NASA's Office of Manned Space Flight, presented recommendations on rendezvous to D. Brainerd Holmes, Director of Manned Space Flight. The working group Rosen chaired had completed a two-week study of launch vehicles for manned spaceflight, examining most intensively the technical and operational problems posed by orbital rendezvous. Because the capability for rendezvous in space was essential to a variety of future missions, the group agreed that "a vigorous high priority rendezvous development effort must be undertaken immediately." Its first recommendation was that a program be instituted to develop rendezvous capability on an urgent basis. Memos: Rosen to Holmes, Subj: Large Launch Vehicle Program, Nov. 6, 1961; Rosen to Holmes, Subj: Recommendations for NASA Manned Space Flight Vehicle Program, Nov. 20, 1961, with enc., "Report of Combined Working Group on Vehicles for Manned Space Flight"; Seamans to Holmes, Subj: Recommendations for NASA Manned Space Flight Vehicle Program, Dec. 4, 1961. Representatives of the Space and Information Systems Division of North American, Langley Research Center, Flight Research Center (formerly High Speed Flight Station), and Manned Spacecraft Center met to discuss implementing Phase II-A of the Paraglider Development Program. They agreed that paraglider research and development would be oriented toward the Mercury Mark II project and that paraglider hardware and requirements should be compatible with the Mark II spacecraft. Langley Research Center would support the paraglider program with wind tunnel tests. Flight Research Center would oversee the paraglider flight test program. Coordination of the paraglider program would be the responsibility of Manned Spacecraft Center. Minutes of Meeting of North American Aviation . . . Program Review, Dec. 5, 1961. 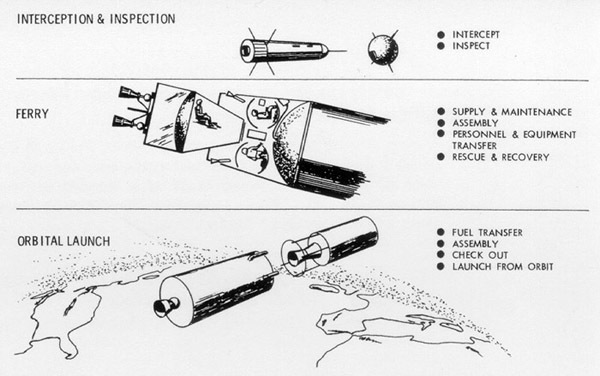 On the basis of a report of the Large Launch Vehicle Planning Group, Robert C. Seamans, Jr., NASA Associate Administrator, and John H. Rubel, Department of Defense Deputy Director for Defense Research and Engineering, recommended to Secretary of Defense Robert S. McNamara that the weapon system of the Titan II, with minimal modifications, be approved for the Mercury Mark II rendezvous mission. The planning group had first met in August 1961 to survey the Nation's launch vehicle program and was recalled in November to consider Titan II, Titan II-1/2, and Titan III. On November 16, McNamara and NASA Administrator James E. Webb had also begun discussing the use of Titan II. Memo, Seamans and Rubel to McNamara, Subj: Recommendations Relative to Titan III and II-1/2, Dec. 5, 1961. Robert R. Gilruth, Director of the Manned Spacecraft Center, transmitted the procurement plan for the Mark II spacecraft to NASA Headquarters for approval--including scope of work, plans, type of contract administration, contract negotiation and award plan, and schedule of procurement actions. At Headquarters, D. Brainerd Holmes, Director of Manned Space Flight, advised Associate Administrator Robert C. Seamans, Jr., that the extended flight would be conducted in the last half of calender year 1963 and that the rendezvous flight tests would begin in early 1964. Because of short lead time available to meet the Mark II delivery and launch schedules, it was requested that fiscal year 1962 funds totaling $75.8 million be immediately released to Manned Spacecraft Center in preparation for the negotiation of contracts for the spacecraft and for the launch vehicle modifications and procurements. Memos, Gilruth to NASA Hqs., Attn: Ernest Brackett, Subj: Transmittal of Procurement Plans for Mark II Spacecraft for Approval, with encs., Dec. 6, 1961; Holmes to Seamans, Subj: Mark II Preliminary Project Development Plan, Dec. 6, 1961, with Seamans' handwritten approval on basic document. NASA Associate Administrator Robert C. Seamans, Jr., approved the Mark II project development plan. The document approved was accompanied by a memorandum from Colonel Daniel D. McKee of NASA Headquarters stressing the large advances possible in a short time through the Mark II project and their potential application in planned Apollo missions, particularly the use of rendezvous techniques to achieve manned lunar landing earlier than direct ascent would make possible. Memo, Holmes to Seamans, Dec. 6, 1961. In Houston, Director Robert R. Gilruth of Manned Spacecraft Center announced plans to develop a two-man Mercury capsule. Built by McDonnell, it would be similar in shape to the Mercury capsule but slightly larger and from two to three times heavier. Its booster would be a modified Titan II. A major program objective would be orbital rendezvous. The two-man spacecraft would be launched into orbit and would attempt to rendezvous with an Agena stage put into orbit by an Atlas. Total cost of 12 capsules plus boosters and other equipment was estimated at $500 million. The two-man flight program would begin in the 1963-1964 period with several unmanned ballistic flights to test overall booster-spacecraft compatibility and system engineering. Several manned orbital flights would follow. Besides rendezvous flybys of the target vehicle, actual docking missions would be attempted in final flights. The spacecraft would be capable of missions of a week or more to train pilots for future long-duration circumlunar and lunar landing flights. The Mercury astronauts would serve as pilots for the program, but additional crew members might be phased in during the latter portions of the program. Report of NASA to the House Committee on Science and Aeronautics, Aeronautical and Astronautical Events of 1961, 87th Cong., 2nd Sess., June 7, 1962, p. 71; Baltimore Sun, Dec. 8, 1961. NASA Associate Administrator Robert C. Seamans, Jr., and John H. Rubel, Department of Defense (DOD) Deputy Director for Defense Research and Engineering, offered recommendations to Secretary of Defense Robert S. McNamara on the division of effort between NASA and DOD in the Mark II program. They stressed NASA's primary responsibility for managing and directing the program, although attaining the program objectives would be facilitated by using DOD (especially Air Force) resources in a contractor relation to NASA. In addition, DOD personnel would aquire useful experience in manned spaceflight design, development, and operations. Space Systems Division of Air Force Systems Command became NASA's contractor for developing, procuring, and launching Titan II and Atlas-Agena vehicles for the Mark II program. Memo, Seamans and Rubel to McNamara, Subj: Recommendations Relative to the Division of Effort between the NASA and DOD in the Development of Space Rendezvous and Capabilities, Dec. 7, 1961; Howard T. Harris, Gemini Launch Vehicle Chronology, 1961-1965, AFSC Historical Publications Series 66-22-1, June 1966, p. 1. NASA laid down guidelines for the development of the two-man spacecraft in a document included as Exhibit "A" in NASA's contract with McDonnell. The development program had five specific objectives: (1) performing Earth-orbital flights lasting up to 14 days, (2) determining the ability of man to function in a space environment during extended missions, (3) demonstrating rendezvous and docking with a target vehicle in Earth orbit as an operational technique, (4) developing simplified countdown procedures and techniques for the rendezvous mission compatible with spacecraft launch vehicle and target vehicle performance, and (5) making controlled land landing the primary recovery mode. The two-man spacecraft would retain the general aerodynamic shape and basic systems concepts of the Mercury spacecraft but would also include several important changes: increased size to accommodate two astronauts; ejection seats instead of the escape tower; an adapter, containing special equipment not needed for reentry and landing, to be left in orbit; housing of most system hardware outside the pressurized compartment for ease of access; modular systems design rather than integrated; spacecraft systems for orbital maneuvering and docking; and a system for controlled land landing. Target date for completing the program was October 1965. Letter, Bailey to McDonnell, Subj: Letter Contract No. NAS 9-170, enc. 4, Exhibit "A" to NAS 9-170, Dec. 15, 1961. Colonel Daniel D. McKee of NASA Headquarters compiled instructions for an Air Force and NASA ad hoc working group established to draft an agreement on the respective responsibilities of the two organizations in the Mark II program. Manned Spacecraft Center (MSC) Director Robert R. Gilruth assigned his special assistant, Paul E. Purser, to head the MSC contingent. Memo, Purser to Gilruth, Subj: Log for the Week of Dec. 11, 1961, Dec. 18, 1961; McKee, "Instructions to Ad Hoc Working Group on the Mercury Mark II," Dec. 12, 1961; "Members of ad hoc working group on Air Force participation in the Mercury Mark II Project," Dec. 13, 1961. A week after receiving it, McDonnell accepted Letter Contract NAS 9-170 to "conduct a research and development program which will result in the development to completion of a Two-Man Spacecraft." McDonnell was to design and manufacture 12 spacecraft, 15 launch vehicle adapters, and 11 target vehicle docking adapters, along with static test articles and all ancillary hardware necessary to support spacecraft operations. Major items to be furnished by the Government to McDonnell to be integrated into the spacecraft were the paraglider, launch vehicle and facilities, astronaut pressure suits and survival equipment, and orbiting target vehicle. The first spacecraft, with launch vehicle adapter, was to be ready for delivery in 15 months, the remaining 11 to follow at 60-day intervals. Initial Government obligation under the contract was $25 million. Letter Contract NAS 9-170, Dec. 15, 1961; interviews: Robert N. Lindley, St. Louis, Apr. 13, 1966; Harry W. Oldeg, St. Louis, Apr. 14, 1966. Memo, Purser to Gilruth, Subj: Log for the Week of Dec. 25, 1961, Jan. 2, 1962; Harris, Gemini Launch Vehicle Chronology, pp. 1, 2. "NASA-DOD Operational and Management Plan for the Gemini Program," Dec. 29, 1961; letter, Holmes to Schriever, Jan. 26, 1962; memo, Seamans and Rubel to Secretary of Defense and NASA Administrator, Subj: NASA/DOD Operational and Management Plan for Accomplishing the Gemini (formerly Mercury Mark II) Program, Jan. 29, 1962; Harris, Gemini Launch Vehicle Chronology, p. 1.